Mass graves are being found everywhere in Mexico, but none of them contain the missing forty-three student-activists. On October 26, in Mexico City at one of the many protests sparked by the disappearances, Elena Poniatowska read the names and provided a short biography of each of the forty-three students. Poniatowska is a journalist perhaps best known for having interviewed witnesses and survivors to the long-denied 1968 massacre in Mexico City’s Tlatelolco Plaza, when the military killed and wounded hundreds of protesters. A lot of what we know about that massacre we know because of Poniatowska. All of the forty-three were students at the Escuela Normal Rural Raúl Isidro Burgos de Ayotzinapa, a left-wing rural teacher-training school. All were politically active. All were from working class or peasant families. The first name Poniatowska reads is: Jhosivani Guerrero de la Cruz. He’s twenty years old, thin, with a willowy face and large, almond-shaped eyes, his nickname is ‘the Korean’ and he has to walk 4 km to the highway to catch the bus and 4 km back because he wants to be a teacher in his village Omeapa.” The forty-third is Israel Caballero Sánchez, who “is studying to become a teacher in indigenous communities.” Poniatowska uses the present tense. Here’s the English translation. Four days later, on October 30, CNN México reported more graves in the municipalities of Zitlala and Eduardo Neri. Officials seemed to have lost track of the exact number. On November 7, Mexico’s attorney general announced that detained members of a gang, Guerreros Unidos, confessed that the police of the towns of Iguala and Cocula delivered the students to them. Some were already dead, the rest, brought to the garbage dump in Cocula, they killed. They then incinerated the bodies in a giant pyre, fueled by diesel, wood and other material, that burned for fifteen hours. They put the remains in plastic bags and threw them into a river. On November 10, it was reported that the remains of “totally disintegrated bodies” found in black garbage bags were sent to a laboratory at the Medical University of Innsbruck, Austria. The director of that lab said that, owing to the high heat applied to the remains, the DNA analysis could take months. On November 12, the Argentine Forensic Anthropology Team announced that twenty-four of the thirty bodies found in other clandestine graves weren’t of the forty-three. Some remains though are beginning to be identified. The son of Jesús Quemada Parra is from Iguala and is currently an undocumented migrant worker in Texas. Mexican officials told him he as to return to Mexico to claim his father’s body. But he can’t afford to make the journey, which the militarization of the border has made extremely dangerous. On November 14, news stories announced that one body, found among twelve others, is of a Catholic priest from Uganda, John Ssenyondo, 55, identified by his teeth and skull. He was ministering in a mostly indigenous area of Guerrero and had gone missing in May. Ssenyondo’s last Facebook post was in March. Seventy-four people, including the former mayor of Iguala, José Luis Abarca, and his wife, have been arrested and charged with different aspects of the crime. Relatives and schoolmates, along with many others, believe these arrests are an attempt to contain the fallout and demobilize the protests, confining the crime to tale of local corruption and regional drug trafficking. “We don’t believe this game they are playing,” said Inés Abraján, the aunt of Adán Abraján, one of the forty-three. The three gang members, she said, “were tortured and forced to say that they killed the students,” as part of a cover-up. Francisco Goldman writes that we might be witnessing the beginning of a second Mexican Revolution. Laura Carlsen says that the disappearances might take the “historic struggle between Mexico’s student left and the federal government, one that has been brewing for years if not decades” (at least since 1968’s Tlatelolco massacre) and generalize it “into the rest of the country.” This last weekend, November 15 and 16, family members of the disappeared led a caravan from Ayotzinapa to Chiapas, where they held mass meetings, protests, and met with leaders of the Zapatistas. 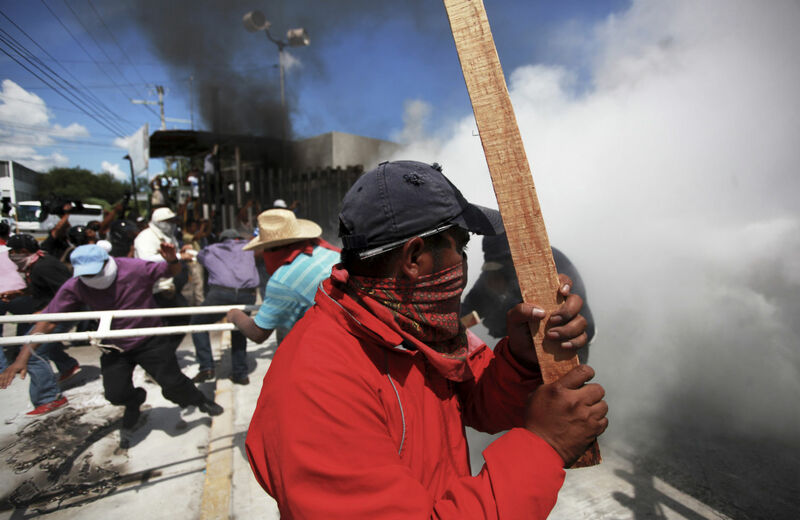 Protests and civil disobedience are spreading throughout Mexico. To blame the violence and corruption on the cartels, or the state’s war on the cartels, is to miss the larger context. Before there was the forty-three, there was the seventy-two—a 2010 mass murder of undocumented migrants in Tamaulipas, fifty-eight men and fourteen women mostly from Central and South America. And then after the seventy-two, there was the 193, a mass murder that also took place in Tamaulipas. The killers spread the bodies out in a number of mass graves. After these killings, the Catholic priests Raúl Vera and Alejandro Solalinde blamed all three levels of Mexico’s government for the deaths: local, state, and federal. They also blamed the United States, saying its immigration and drug-war policy was responsible for the deaths. They demanded the suspension of Plan Merida, or the Merida Initiative. Laura Carlsen says that “besides the nearly $3 billion that’s come through the Merida Initiative, there’s also Department of Defense money, and that money is going to train police forces and armed forces, that now we find are directly involved in attacks on the people, and particularly attacks on youth.” It is possible, Carlsen said, that the Iguala police, who seemed to be operationally undistinguishable from Guerreros Unidos, received financing from these programs. They are “our real bosses, our real patrons,” Solalinde said of the United States. US trade, immigration, and security policies feed off one another, transforming the corridor running from Colombia through Central America to Mexico into a slaughter house. If you Google “Zetas” (the gang responsible for the two Tamaulipas massacres) and “Kaibiles” (Guatemala’s infamous anti-communist unit modeled on the United States Green Berets, which committed some of the worst atrocities during that country’s civil war) you will find out why the Cold War and the drug war really is just one long war. After Guatemala’s civil war was over, ex-Kaibiles migrated to Mexico, where they offered their talents to the Gulf Cartel. Eventually, they broke to form the Zetas (taking advantage of new drug-running opportunities resulting from Plan Colombia, which greatly increased the profitability of transporting cocaine). The Zetas also operate in Guatemala. And the Guatemalan government has deployed the Kaibiles in Mexico against the cartels. This all works out well, since the Zetas continue to recruit Kaibiles into their ranks. The circle is unbroken. During just the six year term of Mexico’s last president, Felipe Calderón (2006–12), who declared a war on the cartels, there were at least 26,000 disappearances and 83,000 homicides. Added to that is the 6000 known deaths of migrants trying to make it into the United States, though the number might be four times as many. Most of the activists killed and disappeared on September 26 were men. But since the implementation of NAFTA, the number of women killed, especially in the town along the US border, has skyrocketed, as shown by the contributors to editors Alicia Gaspar de Alba and Georgina Guzmán’s Making a Killing:Femicide, Free Trade and La Frontera. If you Google-news “fosas clandestinas” and “Guerrero,” you get over 3,600 stories. If you search just “fosa” and “Guerrero,” over 13,000 hits come back. “Fosa” and “Mexico” returns 31,000.